I’ve continually expressed my love for spicy foods ever since having weight loss surgery. I’m constantly playing around with peppers, cayenne, hot sauce and sriracha. 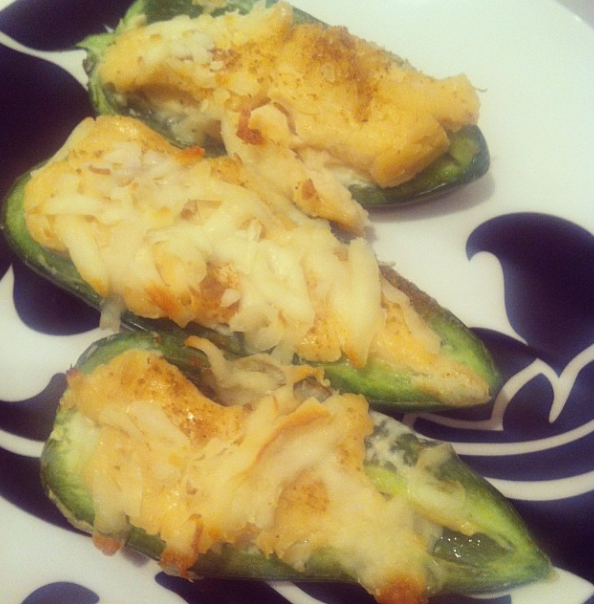 One of my best creations to date are these super low calorie jalapeño poppers. Preheat your oven to 350 degrees. Spray a large baking dish with nonstick spray and set aside. Halve the peppers lengthwise and remove the seeds. Wash halves and dry them well. Sprinkle the cumin directly onto the pepper and stuff with the Laughing Cow wedge. Top with your cheese of choice, I find both mozzarella and parmesan are delicious! Place them onto the baking dish and cook for 20 minutes. You can multiply the recipe and make as many as you want. They are great as an appetizer or perfect to pack in your lunch. Warning: they are very hot! The kind of hot that makes your nose run. Hey, I hear it’s good for your metabolism! What’s your favourite spicy food? Tags: bariatric foods, bariatric recipes, bariatric snacks, bariatric spicy recipes, bariatric surgery, gastric bypass, gastric bypass recipes, gastric bypass surgery, healthy jalapeno poppers, healthy recipes, jalapeno poppers, jalapeno recipes, laughing cow jalapeno flavor, laughing cow recipes, rny, weight loss surgery, weight loss surgery recipes. Bookmark the permalink. Yum, yum, YUM! I’ll have to make these sometime soon!